One Gospel vision is to see inner-cities in southeast Florida transformed by the gospel of Jesus Christ. One Gospel mission is to reach out to the lost to teach, equip, and make disciples by hitting the streets and engaging the culture. We believe there is one God, eternally existing in three persons: the Father, Son and Holy Spirit. (Genesis 1:1, Deuteronomy 6:4, Matthew 28:19, John 10:30). We believe that we as Christians are examples of the love of God in this world. It is this love that we desire to possess and without which we have no right to call ourselves Christians. (1 John 4:16-17). We Believe the Bible to be the inspired, infallible, authoritative, and the inerrant Word of God. (2 Timothy 3:15-17, 2 Peter 1:21). We Believe in the deity of Christ (John 10:33); His virgin birth (Isaiah 7:14, Matthew 1:23, Luke 1:34-35); His sinless life (Hebrews 4:15, 7:26); His miracles (John 2:11); His vicarious and atoning death (1 Corinthians 15:3, Ephesians 1:7, Hebrews 2:9); His resurrection (John 11:25, 1 Corinthians 15:4); His ascension to the right hand of the Father (Mark 16:19); His personal return to earth in power and glory. (Acts 1:11, Revelation 19:11-13, Revelation 19:14-16). Evans Jean loves the gospel of Jesus Christ. He is a person that enjoys equipping people with sound biblical teaching. He graduated from Liberty Theological Baptist Seminary and earned his Masters of Arts in Biblical Studies. 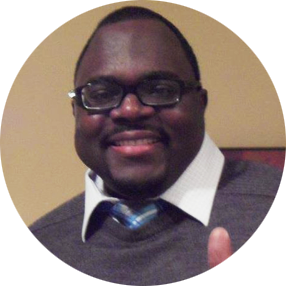 He is an associate pastor at Philadelphia Church of the Newborns located in Riviera Beach, Florida. He is involved in prison ministry through Prison Fellowship where he teaches and preaches to men. He is the founder and president of One Gospel Ministries. He is married to Ruth and they have one child. One Gospel is a Christ-centered outreach ministry that exists to spread the gospel of Jesus Christ in the urban cities around Southeast Florida. We see the need to be a liaison to partner with local churches that are already planted in inner cities.